Hello everyone, I hope you're all well. I've had quite a rough week; I was dying with a cough and a big flu in general. I'm in top form however now, and I'm determined to make my second week of 2012 a better one! I've received a good few requests to make a blog post on my room - what it looks like, how I store my bits'n'bobs and all that jazz. I thought I'd do an updated one, I made a room tour video in October (posted below), but I've made a few changes since then. The majority of things are the same however, so I hope both photos and video give you some sort of insight into my wee cubby hole! My room is a tiny room, as you can see. I don't sleep in this room, I sleep in the guest room so I use this room as my little hideaway. I love the 'shabby chic' look, and stick pictures and posters up everywhere, as I'm quite a visual person. I like having my interests on display; my love for Old Hollywood, my book and dvd collection, photos of my family and friends etc. I must say, I'm terrible at keeping my room tidy, I have to do a big clean-up every few months. This is definitely my room at its best (I had a clean-up yesterday, wouldn't you have guessed). It may look cluttered to some, but this is totally how I like it! Although, I'd definitely prefer a larger room.. or mansion. 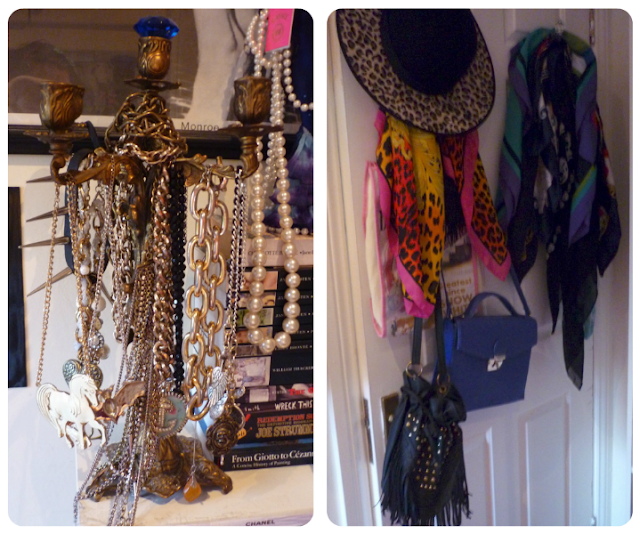 My Nana gave me a vintage brass candlewick, and I use it as my necklace holder - smart thinking, eh? I have a cluttered desk, yes but it NEEDS to have all of this shizzle on it! The products to the right, are products I use all of the time. Yes, ALL of them.. The clock struck 3.30pm, and it rapidly started going dark.. feck you Winter! Excuse these dodgy pics, I like to call them 'race against time' snaps. Oh, how I'm dying for Spring to come along..
Products, products and more products. The yellow case holds all of my nail polishes. My DVD collection, most of them are favourites of mine! Some of my storage; A BT's bag full of giveaway shizzle, a Fearne beauty box filled with products I need to review and a Soap & Glory beauty box filled with sunglasses and hairbows. P.S I redesigned my Tumblr the other day, I love it - check it out here!